This listing is for an E-Pattern to print yourself at home on your home printer's USA letter and A4 sized paper. This requires a LOT of paper to print- read below for more information. A Wearing History Resto-Vival™ pattern based on an original historical pattern from circa 1939. This pattern works well for late the 1930's through the early 1940's looks, but is so classic it can seamlessly be integrated into your modern wardrobe. Misses' Bodice, Shorts, Skirt, & Girdle (belt). The bodice blouse is about waist length, has a square neckline, release tucks at front, short sleeves, and closes at the front with buttons. The shorts are cut full, have release tucks at front, and are finished with interior belting at the high waist. The bias cut skirt can be made in a short or long length and is finished with interior belting at the high waist. The girdle belt is made in contrasting fabric and can be worn with the skirt or shorts. It is worth noting that the shorts have a period authentic vintage cut, which has a longer rise (crotch length) than modern shorts. 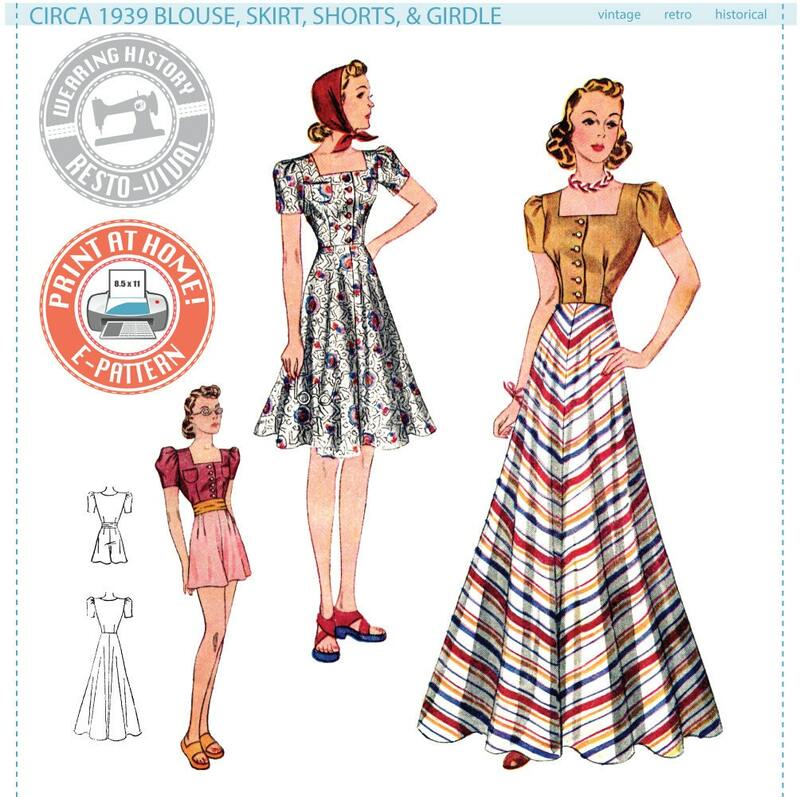 This pattern includes a blouse, shorts, skirt, and girdle (cummerbund belt). If you make the top and skirt in the same fabric it looks like a two piece dress. If you make the top and shorts in the same fabric it looks like a playsuit. If you use coordinating fabrics for the blouse, short skirt, and shorts in fabrics you've got a mix and match vacation or day to day wardrobe. If you add a long skirt to the vacation wardrobe it can carry you into evenings or be worn as a maxi skirt. Add the cummerbund girdle belt (a gathered fabric that closes with hooks and eyes) for that iconic late 1930s/early 1940s beach look. Intermediate Difficulty. Must be familiar with basic construction and vintage methods. In WOMEN’S sizing. 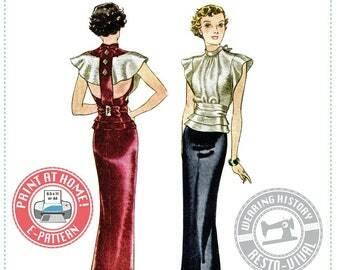 This vintage sizing standard was for a more mature figure. Misses, Petites, Plus Sizes, and Talls may require alteration to fit correctly. Because of this, no layout charts or yardage estimates are included for that size. Test your placement when making a mock up to see how much fabric you will need of your final fabric. Please see the photos for an image of the yardage requirements. This pattern comes in 1 zip file that includes the pattern and instructions, and 1 pdf for how to print. This pattern uses a LOT of paper. 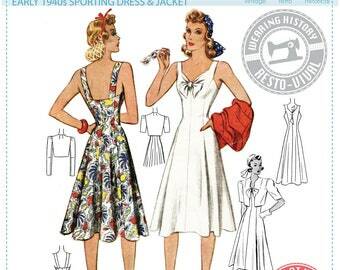 104 total sheets of 8.5" x 11" sized paper or A4 sized paper are needed to make all garments in this pattern. This pattern file is formatted to fit on both sizes of paper, and there will be varying thicknesses of white border, which will be cut off, according to pattern instructions.